This section ist about writing emails. Start here and work yourself through the page exercise by exercise! 1. What do you think about when you see...? What do you think when you see the following words and phrases? 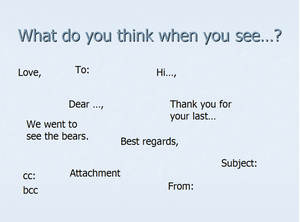 Right, these are words and phrases from an email. In this lesson, you will learn which words and phrases are necessary to write an email. At the end you will write an email yourself. You can do the exercises as often as you like! Have fun! Read the email and answer the questions! Click on the picture to make it bigger! 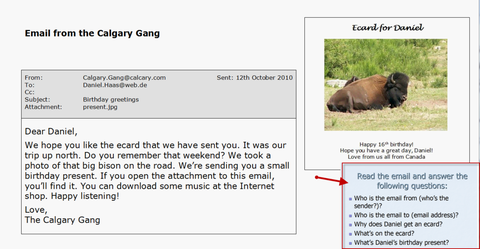 Load the file email_from_the_Calgarygang.avi from your desktop and read and listen to the text again!! Do the following exercises to make sure you have understood everything! 4. Do you know the parts of an email? 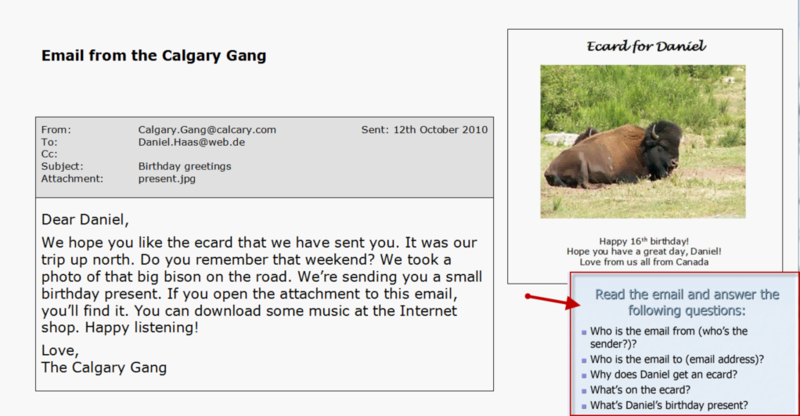 Daniel answered the Calgary Gang's email. But unfortunately his email has big problems... Help Daniel to put some order into the chaos! 6. Now its your turn to write an email! You have practiced a lot! Du kannst jetzt schon wirklich eine Menge! Daher solltest du nun selbst eine E-Mail schreiben. You can write an email with some help! Schreibe eine E-Mail mit Hilfe des Formulars. Wähle die fehlenden Sätze und Satzteile im Formular aus. Write an email yourself and follow the instructions in the file! Hier ist eine Übung über die Hauptbestandteile einer englischen Email als Formular.